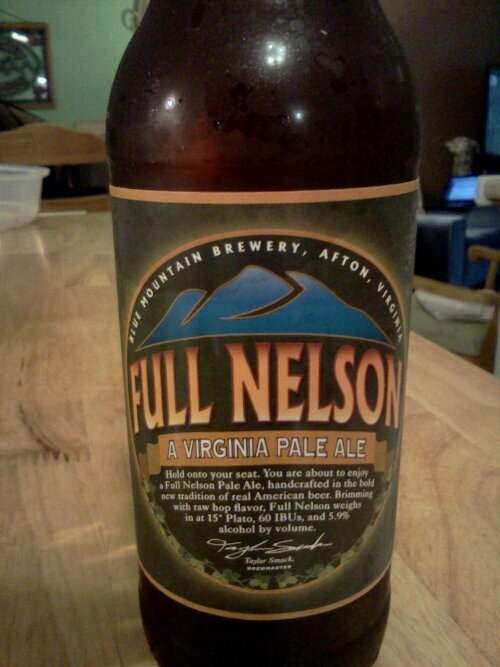 Full Nelson, the Beer | Robert Mitchell Jr.
I’m not a beer expert, I just like to have a beer on cheat day (for more on what this whole cheat day thing is all about, see here and here). So when I saw a beer on the shelf called Full Nelson, being an aficionado of the great Western martial art of wrestling and all, I had to put a couple in my mix-n-match six pack. How was it? Just the right about of bitterness, lots of hops and a few flowers for finish. I’m telling you, this is good stuff. Hat’s off the folks at Blue Mountain! †Did you get that joke? Remember the Old Milwaukee commercials: “It doesn’t get any better than this…” I couldn’t resist. This entry was posted in Green, Martial arts and tagged beer, full nelson. Bookmark the permalink.